1. Twitterists – Starting off with most interesting Twitter user directory. It lists different celebrities involved in dishing out tweets along with their saucy photos and of course respective latest tweets. 2. 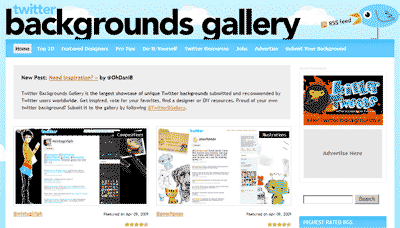 Twitter Background Gallery – After some celebrity inspiration its time for some creative design inspiration. Twitter background gallery has listing of hot N cool looking Twitter backgrounds. You browse designs from different categories and leave comment on best ones. Even follow people with cool looking backgrounds. 4. Twellow – They describe themselves as the Twitter yellow pages. Rightly so, as their homepage is stacked with loads of options and information (like printed yellow pages!). Use search box or select any category to get going. 5. TwitR – Another well organized and neat looking Twitter user directory. Homepage has listing of big shot tweeters from different categories like social media, blogging, tech etc. Give it a bump! 6. LocalTweeps – It aims to localize twittersphere by help connecting with local Twitter users. Enter your zipcode and see who is on Twitter and living very close to you. 7. TwitProfiles – If you know a Twitter username and want to see more information related to that username, Twitprofiles is the place. It shows, number of followers, following, along with latest tweets for any Twitter username. 8. Twapps – It is well organized and neat looking Twitter apps directory. You can browse Twitter apps from different categories like web apps, mobile, desktop apps etc. Click through any listing to see more details and apps access link. 9. Twitdom – Another well organized Twitter apps directory. It has loads of Twitter apps listing under different categories. Interface is neat and even show alexa rankings for specific apps in the listing. 10. Twtbase & Twi5 – Rounding off with two more Twitter apps directory. Both has listing of different Twitter apps from different catogiries. They may not have best of looks but content is worth bumping into. Besides above, there are many more Twitter apps, gallery and related sutff. How about sharing with us by adding a commnet? I would also add twimagination.com a Twitter application that allows you to share your short writings such as fiction stories, poems, novels, fairy tales, fantasies, dreams or any other products of your imagination through Twitter. #11 Twitter Directory 2000, the Twitter Directory for the rest of us.